Bluewater Comics' ongoing biographical series Fame has already featured several high-profile athletes. The most recognizable face in golf, Tiger Woods, is the subject of a new issue that hit newsstands, bookstores, online retailers and comic shops yesterday. Despite Woods' recent troubles, both on the course and off, his presence at any golf event increases ratings exponentially. That level of fame carries over to the collectibles market where his exclusive deal with Upper Deck Authenticated has brought numerous figurines, framed art and autographed pieces to collectors. It seems only fitting that the once-dominant Woods be paid tribute in comic form as well. 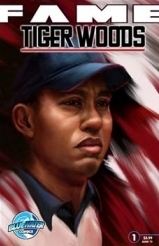 Fame: Tiger Woods showcases a cover created by Tony Foti. The interior art is by Marcelo Salaza and the story is written by C.W. Cooke. The comic retails for $3.99.